Kelly L. Winfrey, PhD, is assistant professor at the Greenlee School of Journalism and Mass Communication and faculty with the Carrie Chapman Catt Center for Women and Politics at Iowa State University. Winfrey, Kelly. 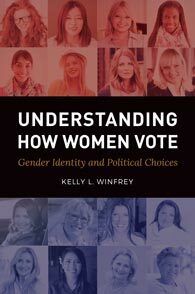 Understanding How Women Vote: Gender Identity and Political Choices. Praeger, 2018. ABC-CLIO, publisher.abc-clio.com/9781440840319. Uncovering the psychological and sociological reasons for the gender gap in American politics, this fascinating volume explores how such factors influence women and lead to their political beliefs and behaviors.